THIS IS THE COOLEST THING.I CANT BELIEVE THAT ITUNES HAS JOE SATRIANI LESSONS .AWESOME! Loved the podcast. Saw this concert and must say Joe you are the man!!! I have a much greater admiration for all solo guitarist since seeing you! Can't wait for the next album. I'm a big Satriani fan, I have all his cd's and although I like many of the other virtuoso guitarists (vai,malmsteem,buckethead) I've always felt Joe has a special gift for writing beautifull melodic pieces that put him at the very top. I'll keep it short, this is probably his 2nd best CD just below Crystal Planet. Super Colossal is absolutely great! Rocking, catchy hooks, and absolutely beautifull melodies. My favorite song off this album is "Ten Words"; in my oppinion this might be his greatest song yet... and that's saying something. I read in an interview that Ten Words was inspired by the events of 9-11. It is such a beautifull song I almost cried hearing it. No one else alive could write such a stunningly evocative piece of music. Thanks Joe for a brilliant CD! Wow. Satch got his groove back. The music here is awesome. Satch's music has finally gotten back on track with solid tracks from 1-10 (so far) His last releases had good tracks but some really terrible tracks also. So far I haven't heard anything I don't like in the teasers. The drawings are terrible but what do you expect from a guitarist the Mona Lisa? I enjoyed listening to Joe explain his music. I noticed he always says "...to it" which is funny. I like what I hear so far,I have bought every album of Joe's, and I can't wait to buy this one. Even better, I'll have yet another show to go to. why are there two different albums for this? Joe is simply amazing. Unlike some other reviewers I don't over analyze the music, I just enjoy it, and Super Colossal is looking to be another winner if the clips tell the story! I have been a fan for years and love what I have seen thus far....I have already purchased tickets for his upcoming tour in Chicago at the House of Blues and cannot wait to go!! Joe you with Eric Johnson is a dream come true for me and I look forward to your new disc and know your fans will be so impressed.....KUDOS SATCH! C-Ya in CHI - TOWN! JS Continues to Amaze Me!!! He just keep evolving and evolving and evolving!! I've always been amazed with what JS can do with the most complicated of all arrangements, but I'm even more amazed with what he does with the most simplest. In my world he is truly the best and there is absolutely nothing he does that I do not like. I will be doing my third "Platinum Ticket Experience", and for those who have not taken advantage of this offer, I would highly, highly recommend it. Joe Satriani and his staff make it the best!!! The music teaser sounds really great. And it would be really cool if Satriani released more video podcasts of playing his guitar! What a fantasic way to generate buzz around his new release. I've been a big fan of Satriani for a long time. I've been too busy to keep up with the schedule, so when this podcast popped up, I jumped all over it. The songs are tremendous - the introduction and explanation of each adds an insight not normally found or offered by many artists. A quick trip out to his web site reveals his new tour with Eric Johnson! It does not get much better than this. Check it out - it's definitely worth the download! Finally got it right ! I have all of Joe Satriani's CDs. After Crystal Planet I think the albums seemed to be without direction or purpose. Some decent tracks but mostly guitar ramblings. I had decided that after years of buying Joe's albums I was not going to buy this one because it is going to be the same as SBM and ITLIS. That the era of Joe Satriani might be over. However, with this album it looks like Joe has changed his direction towards making beautiful music. That is not strange. Sometimes less is more. Although Joe talks about so much layering and sound engineer stuff here, overall the songs sound very good, actually beautiful. The only thing that I don't like in Joe's music is the eerie sad melodies, e.g. chords of LIFE, just look up, (don't like some of that east coast sound). Some tracks are really good and Super colossal is definitely worth checking out. 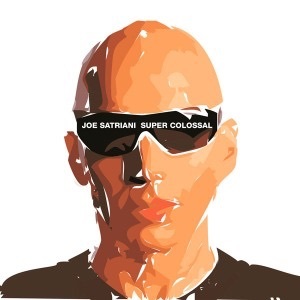 Also do check out Joe Satriani's self titled album. That represent a very mature/serious and bluesy aspect of his music, no Joe Satriani collection is complete without it. As it is said--it is a preview of the upcoming album; if it plays the songs in all of its entirety it wouldn't be called preview, isn't it? That said--I love the podcast and his explaining of the underlying theme of each of the songs of the upcoming album. I'd say I'll look forward to it, but only if Sony (that IS the label he's under, is it not?) does not place a DRM inside the CD. Otherwise, I'll enjoy listening to you on the radio, if you'll be around for it. I have been away from the Satriani scene for a few years after his so-so release The Extremist (my opinion so buzz off if you don't agree). This Podcast did exactly what he was looking for...generated interest. What a great way to let us see the development of the album while giving us a sample of some great upcoming music! Every song has a great hook and I love the descriptions of his vision of the song. It brings even more life to it! This should be a super album to own and I can't wait to get it! The comments by Joe and video are a real treat. The sketches are interesting but nothing to write home about. The highlight of these clips is the music preview. Joe continues to evolve his sound even further, yet keep that distinctive Satch sound. The layering of sounds and textures is evident even in these small clips. I cannot wait to hear the rest of the tracks. Bring it on!